His Peanuts comic strip, books, and TV special A Charlie Brown Christmas, as well as his commissions for The Saturday Evening Post. "A cartoonist is someone who has to draw the same thing day after day without repeating himself." The following is excerpted from the biography Schulz and Peanuts by David Michaelis. 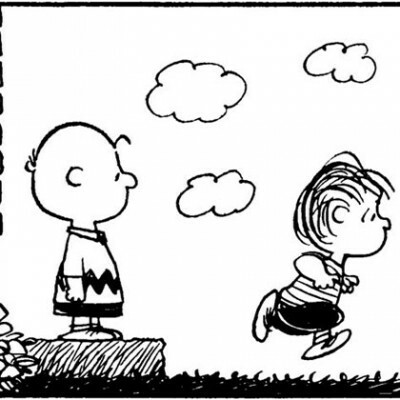 In this passage, young Charles “Sparky” Schulz sets off to serve in World War II on the eve of his mother’s death. The great troop train, a quarter-mile of olive green carriages, rolled out of the depot and into the storm. Nearly a foot of snow had fallen on the Northwest through the day, and now, in the short winter afternoon, the blizzard veiled the domed heights of the State Capitol in St. Paul and the pyramid-capped Foshay Tower, tallest building in Minneapolis. Snow curtained the Twin Cities from one another, blurring everyday distances. Only the railroad and streetcar tracks cut clear black lines into the mounting white cover. To his fellow recruits he presented himself as nondescript: simple, bland, unassuming-just another face in the crowd. With his regular looks, he passed for ordinary so easily that most people believed him when he insisted, as he did so often in later years, that he was a “nothing,” a “nobody,” an “uncomplicated man with ordinary interests,” although anyone who could attract attention to himself by being so sensitive and insecure had to be complicated. No matter what the others said or did, Sparky sat watching the snow sweep up to and pull away from the window, giving no sign that he had just come through the worst days of his life. He would never discuss the actual kind of cancer that had struck his mother. Throughout his life, friends, business associates, and most of his relatives believed that Dena Schulz had been the victim of colorectal cancer. In fact, the primary site of his mother’s illness was the cervix, and she had been seriously ill since 1938. As early as his sophomore year in high school, Sparky had come home to a bedridden mother. Some evenings she had been too ill to put food on the table; some nights he had been awakened by her cries of pain. But no one spoke directly about her affliction; only Sparky’s father and his mother’s trusted sister Marion knew its source, and they would not identify it as cancer in Sparky’s presence until after it had reached its fourth and final stage-in November 1942, the same month he was drafted. On February 28, 1943, with a day pass from Fort Snelling, Sparky returned from his army barracks to his mother’s bedside, mounting the stairs to the second-floor apartment at the corner of Selby and North Snelling Avenues to which the Schulzes had moved so that his father, at work in his barbershop on Selby, and the druggist in his pharmacy around the corner, could race upstairs to administer morphine during the worst of Dena’s agonies. That evening, before reporting back to barracks, Sparky went into his mother’s bedroom. She was turned away from him in her bed against the wall, opposite the windows that overlooked the street. He said he guessed it was time to go. The blizzard had brought everything to a halt. But the train drummed on across St. Paul, and landmarks familiar even in the snow slipped past his window, alerting him that his own neighborhood was approaching. Then there it was for all to see.